All work with live material in the AIF must be cleared by Michael or Frank before beginning the experiment. Any material that may be hazardous (whether biological or chemical) must be preapproved by Frank or Michael and by Environmental Health & Safety when applicable. We are not equipped for work with radiation or pathogens. No radioactive material may be used in the AIF. All users must be trained by AIF staff. Nobody may use any equipment unassisted without first being checked out by a member of the Facility staff. Any time on any piece of equipment-- even just a five minute look-see-- must be logged in the appropriate logbook. Users may not change default settings on any machine. Users caught doing so may be billed for any time necessary to correct the problem and may be banned from future use of the equipment. It is essential that the next user be able to use the equipment after you are done with it. When done, equipment should be left clean and in standard configuration. Please notify a staff member if there is anything wrong with a piece of equipment. The AIF is a first-come first-served facility. Plan Ahead! People who work unassisted may sign up for equipment in advance on a first-come first-served basis. We encourage unassisted usage of the AIF equipment at any time, however... Nobody may use any equipment unassisted until checked out by AIF staff. On some equipment (e.g. the BioRad confocal) you may work with non-AIF staff colleagues, but you may not work alone unassisted until you have been checked out by AIF staff. There are no exceptions to these rules. People who need to work with staff may sign up with the staff member(s) on a first-come first-served basis. However, in the interest of assuring that the AIF continues to operate, if an emergency service, maintenance or administrative issue arises, the staff may need to cancel and reschedule. Sign up times are strict. If another user is scheduled after your appointment, you are expected to vacate the equipment promptly at the end of your scheduled time. No user may book more than 3 hours in any one day (9:00 AM to 6:00 PM) without first obtaining permission from AIF staff. Users who, without giving notice, are more than 1/2 hour late for an appointment may have the appointment canceled. Users may be billed from the sign-up time (so you are billed for the time you are late) but users are not billed if they leave their appointment early. If equipment breaks, appointments will be canceled and rescheduled. Normal service is schdeuled in the same first-come first-served manner as usage by researchers. The cooled CCD digital stations, inverted Olympus microscope for microinjection and multi-photon confocal were purchased specifically for work with live material. Therefore, investigators imaging live material on these stations have priority sign ups up to the Friday of the week before the appointment (unless an AIF staff member has signed up for a training or assisted appointment). To make an appointment, please call, email or leave a note and do not walk in to interrupt somebody else's appointment. All projects must be approved by Frank Macaluso in advance. Experimental design, special issues (such as dealing with pathogens), and scheduling must be agreed in advance. Preps are done two days per week on a strict schedule. No data may be stored on Facility hard drives for longer than the time signed up for equipment use. [We are flexible in that if there is sufficient disk space, you may leave your data for a few hours or in case your data transfer did not work.] All data must be saved in the designated User Files directory. Any data on the desktop or other system directories will be deleted without warning. At the end of your session, you must remove your data. Therefore, budget your time accordingly. A minimum of 500 MB must be left on each hard disk. If there is a problem with disk space while work is in progress, files may be summarily deleted. Each user should have his/her own disk for data storage or should arrange as part of the scheduled session on the computer to transfer his/her files to external media or to a computer elsewhere via ALNET. 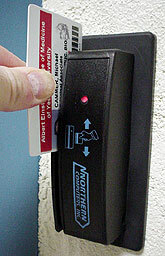 We encourage unassisted usage of the AIF equipment at any time, however our policies regarding door codes and unique user access must be strictly followed. Do not put biohazard waste in normal garbage cans. gloves; microscope slides; coverslips; pipette tips; culture dishes; tubes. If you use hazardous or autoclaveable material here, please take your garbage with you. If you wish to include grant numbers, for the correct references please contact the Marion Bessin Liver Research Center and Comprehensive Cancer Center directly. Information on billing can be found here.